I welcome the first day of spring with my spring cleaning tasks around the house, which includes my backyard weather station! Especially after winter storms with strong winds and heavy rainfall, I like to go take a peek at the status of my weather station. I check to see if the anemometer made it through the winter unharmed with no cracks and can spin freely, and I also make sure the rain bucket is clear of leaves, bugs and spiders, and even bird poo! Is your rain gauge reporting 0 inches of rain when it has been raining all day? If so, your rain gauge may be clogged! It is recommended to rinse it out a few times with warm, soapy water to remove all the gunk inside. 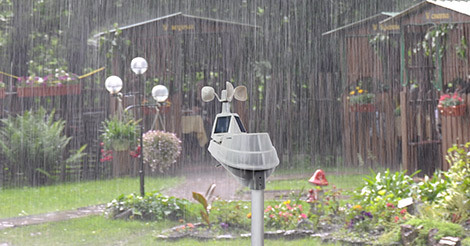 To eliminate any erroneous rainfall measurements to your My AcuRite dashboard, just simply remove the batteries from the 5-in-1 before cleaning out the system (or the rain gauge if you have the stand alone unit). 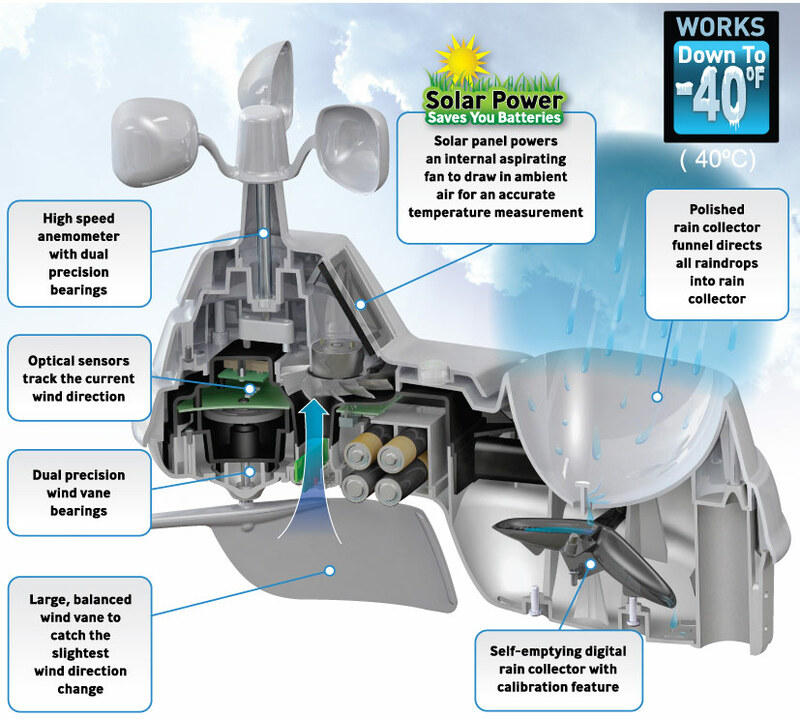 Without the batteries, the unit will not transmit any data to the Access so erroneous rainfall data will not transfer to your My AcuRite dashboard or graphs. Make sure your wind speed and direction measurements are accurate by ensuring your cup anemometer and wind vane are able to spin freely. Dirt or dust can get in and disrupt the bearings, and you can fix this by cleaning the sensor with warm water. Actually, ice can freeze the anemometer from spinning freely, so also make sure to check the station after winter storms! 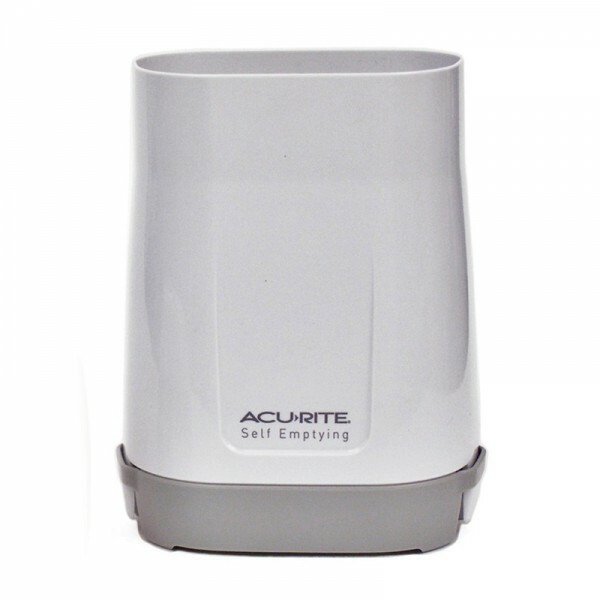 If any parts are cracked or broken, or not spinning freely, you can order new wind cups or wind vane for your 5-in-1 directly from AcuRite for very reasonable prices! 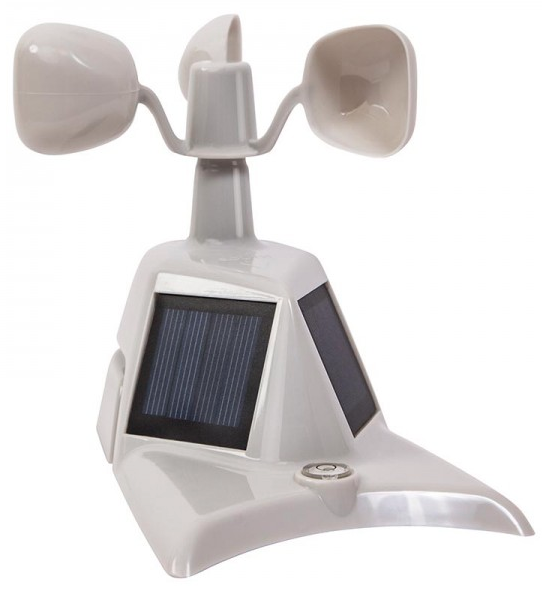 If there was major damage this winter, then you may want to order a new wind cup assembly or upgrade to the Pro version. Your solar panels must be cleaned regularly to maintain highest functionality possible. When the photovoltaics are dirty or dusty, the station is not receiving maximum power available. Warm water and soap will do the trick. Also, for highest efficiency the solar panel should face due south in the northern hemisphere (north in the southern hemisphere). Our advice? Clean the entire 5-in-1 unit! Simply clean off the entire unit using a rag and warm soapy water. This will clear bugs, spiders, and spider webs away from any inlet areas for more realistic temperature and humidity measurements. It is recommended to clean your weather station at least twice a year, so you'll likely hear from me again in the fall reminding you to go clean your weather station! Question, with the spring cleaning is it suggested to open up the 5 in 1 and clean it out as well to make sure no bugs got inside? Yes, that's a good point. If you feel comfortable opening up the unit from the bottom with a long screwdriver to reach those deep screws, then go ahead and open it up to clean out any bugs, leaves, etc. Just be sure to not adjust the rain calibration screws which are also on the bottom of the unit. Another thing to do when it is open is to add a couple of moth balls held in place with some duct tape to keep the spiders out. It does work! Thank you for the tip also! Had a few sprinkles the other day and wondered why the rain gauge didn't register anything. I opened up the unit and found two wasp nests inside with wasps! What a surprise. Found a wasps nest too inside when checking the non-functioning rain gauge, not the only one it seems. You can avoid things like insect infestations by taping a moth ball to the inside of your outdoor device. I live in the northeast so I am concerned about freezing temps.Will the mechanics function properly after freezing?